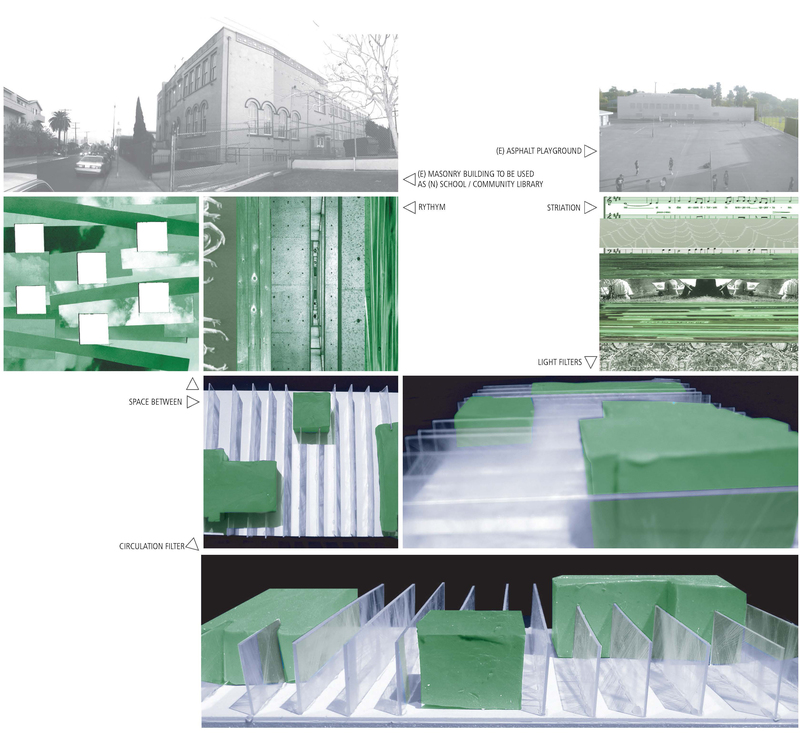 The project for the St Thomas K-8 and adult night school explores the potential to connect to the surrounding South Los Angeles community by re-envisioning the spatial and programmatic scope of a school. Due to its dual function, the premises will operate at night and weekend in addition to normal school hours. The project strives to create a center for learning that engages all members of the community through its program and visual organization. 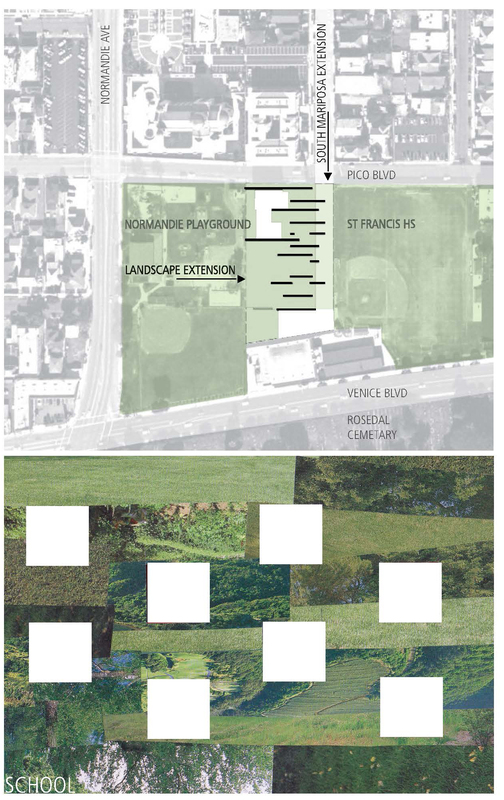 The proposed site is flanked on one side by a public park and on the other by a private high school. Predominately covered by asphalt, the lot interrupts the greenery of the park on its west, and shows a stark façade to the small community street that terminates on its north border. In order to provide a viable creative atmosphere integrated with the community, the project extends the park and community street into the school: the former as a greenscape that blankets the site and blurs the boundaries between public park and school, inside and outside, work and play; and the latter becomes a pedestrian promenade engaging both students and the community to explore the project. By establishing the infrastructure to link the community to the project, the school’s boundaries become blurred thereby extending its advantageous functions (library, lecture hall, public area, cultural area) beyond its physical borders. One existing brick building at the northwest side of the site remains to function as the library – easily accessible to students and community . At its southeast corner, the proposed public promenade leads to the new lecture hall. 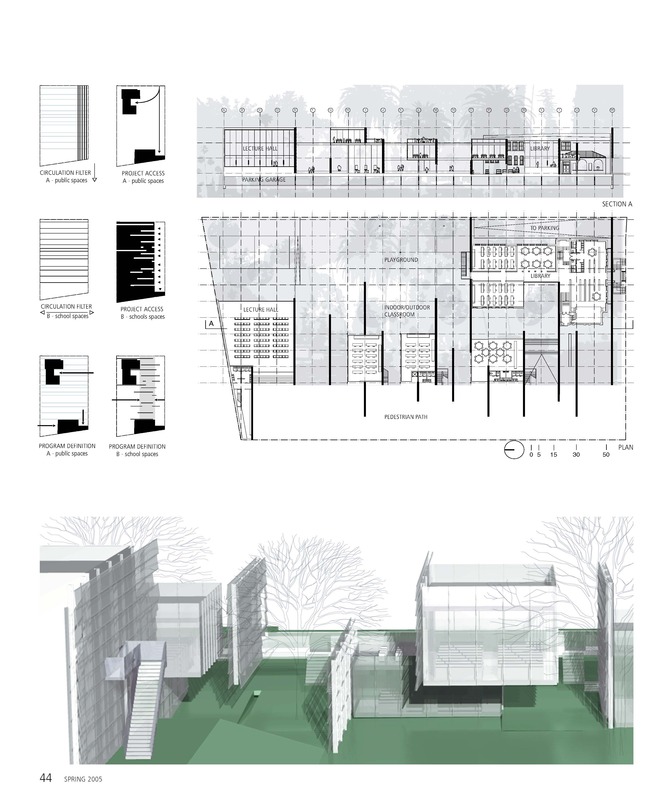 The school, then, is envisioned as a sculpture garden comprised of a series of wall elements to organize the school spaces and anchored at its two extremities by program that serves both school and its extended community.